Claudio Calmens was born in Bahía Blanca, Argentina in 1962. He lives near Buenos Aires, where he is a Professor of Guitar in La Plata Conservatory, and at the School of Arts in Berisso. As a guitarist, composer and performer he works frequently in a wide variety of contemporary music and theatrical contexts in Argentina and elsewhere in Latin America. He has been a member of the avant garde performance group known in Argentina as the “alternative sonority” composers, and was a student of classical guitarist Jorge Martinez Zárate. He studied composition and electronic media with Enrique Gerardi, and now performs on classical, electric and MIDI guitars. 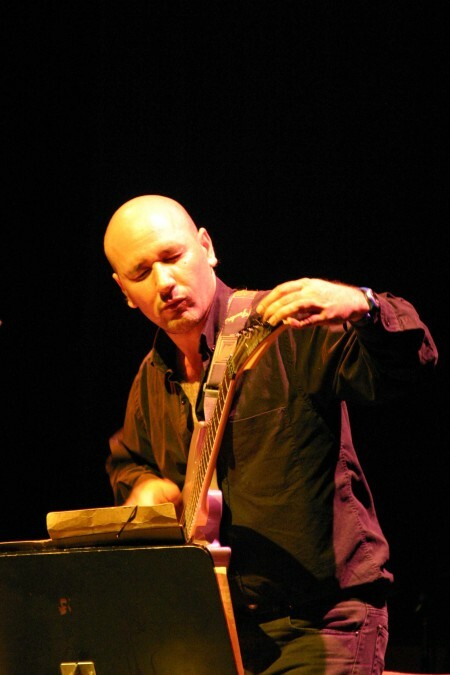 Since 1992, Claudio has been performing frequently as a contemporary guitarist, and a number of composers have written works especially for him. His live performances often incorporate original texts, and theatrical collaborations with Graciela Peralta López. This is Claudio’s first visit to the US, and his current tour is sponsored by the Dartmouth Dickey Foundation for International Education, Dartmouth College, and Frog Peak Music (a composers’ collective).